When Oxfordshire County Council (OCC) was awarded a three year funding package for major highways maintenance projects, Skanska, their term maintenance contractor, appointed OnSite to carry out the extensive mapping and condition reporting on Oxfordshire’s vast surface water drainage network. Areas within the region that historically were susceptible to flooding were identified. OnSite proceeded to clean them using high pressure water jetting (HPWJ), high volume recycling tankers to clear accumulated silt and debris. This allowed OnSite to undertake CCTV surveys of the pipelines to assess the condition of the drainage network and identify what could be done to remedy the flooding incidents. To date, OnSite has cleaned and inspected over 95,000 meters of the drainage network and has removed thousands of tonnes of silt and debris, allowing the drainage to function more effectively. 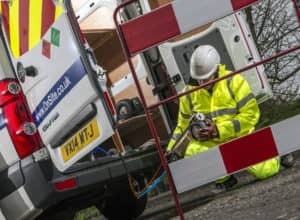 This none-intrusive rehabilitation technique is not only highly effective in improving the integrity of the pipework but it minimises disruption to the surrounding road network and community compared to traditional dig-down and replace methods. During the CCTV surveying, cleaning and remediation works, OnSite recorded and collated asset data directly into Kaarbontech Asset Mapping software in real time using handheld tablets. This OCC prescribed software package allows the recording of all pertinent asset information including; STC25 manhole data, Wincan Sewer condition grading, locations , silt levels and defects. The works completed in this project has allowed OCC to develop an accurate and detailed picture of all their drainage assets. As any future works are undertaken on the highways drainage system in Oxfordshire, the asset database will be updated allowing for more effective management of the network.